Extreme heat and humidity can do funny things to your brain – especially if you’re from Seattle, where fleece jackets are considered summer attire. I keep starting projects from my perpetual To Do list (Sell Things on Ebay, Vacuum Crumbs out of Kitchen Drawers, Start Kids’ Scrap Books) but quickly lose focus and end up napping with the cats. Thankfully we have air conditioning, but it can barely keep up with these record heat waves. Not surprisingly, there hasn’t been a whole lot of cooking going on in the kitchen this summer! 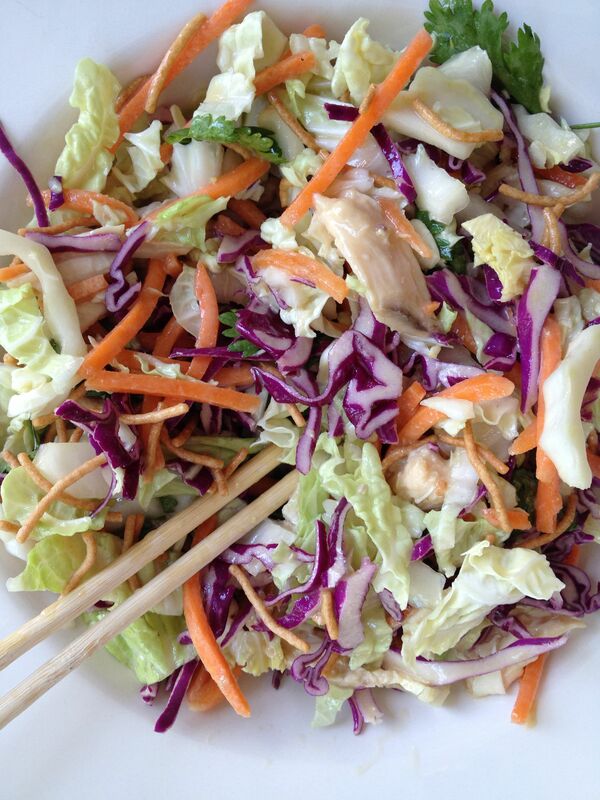 This recipe is a variation of Wolfgang Puck’s Chinois Chicken Salad – which now you can find at airports and food courts across the country but I first experienced years ago at his Santa Monica hot spot, Chinois on Main. (Jennifer and Brad were leaving just as we arrived!) 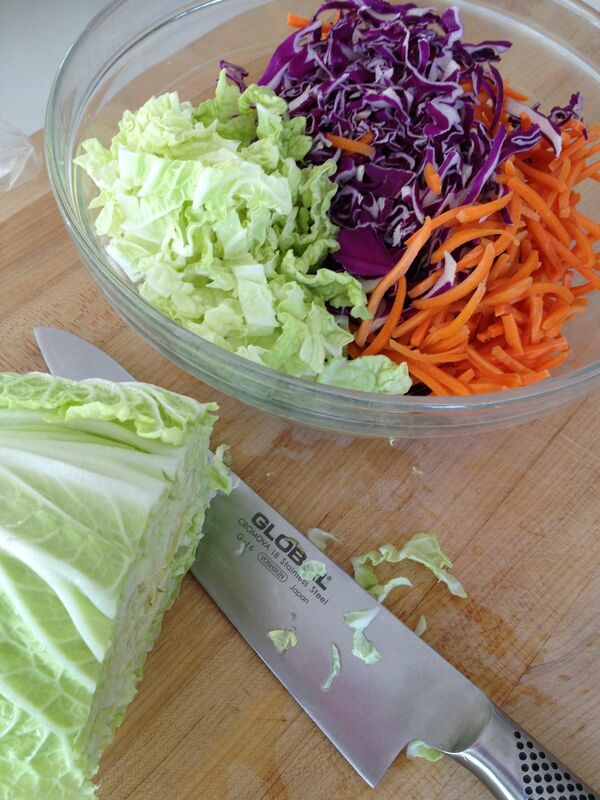 I’ve modified the dressing (which has an almost wasabi-like kick from the Coleman’s mustard) and will often use packaged cole slaw mix and julienned carrots instead of or in addition to chopped napa cabbage. Feel free to add any vegetables you like and/or have on hand: thinly sliced red bell pepper, julienned snow peas, cucumbers, whole snap peas, etc. For fancier occasions, you could make your own won ton strips (see how-to here at the end of Thai Crunch Salad) instead of using the thin rice noodles (which are actually made from wheat and rice flours). 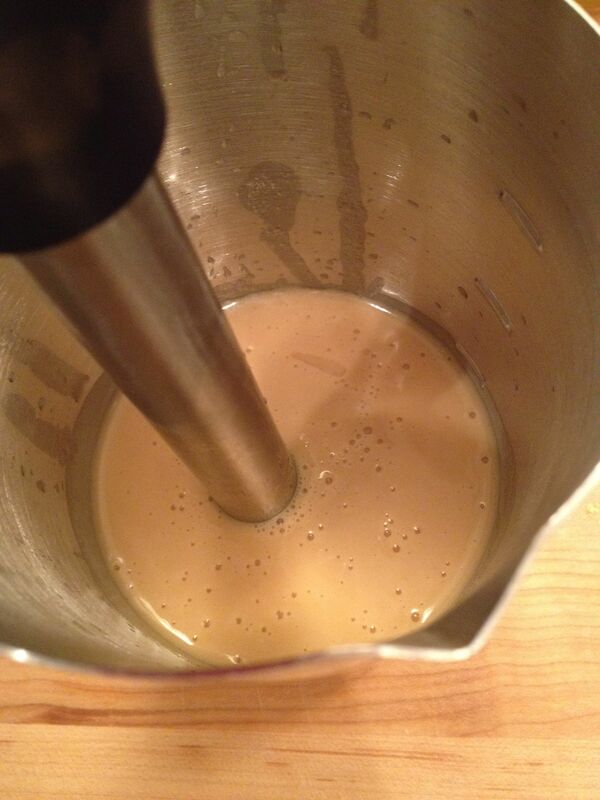 Add first 5 ingredients to a blender or beaker of an immersion blender; slowly add peanut/vegetable oil with blender running until all incorporated. 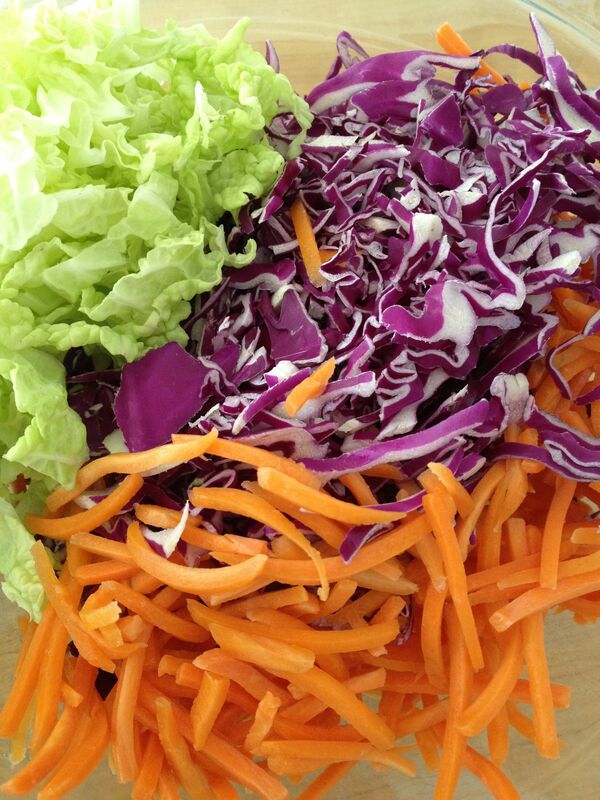 To a large salad bowl, add cabbage, vegetables and chicken. 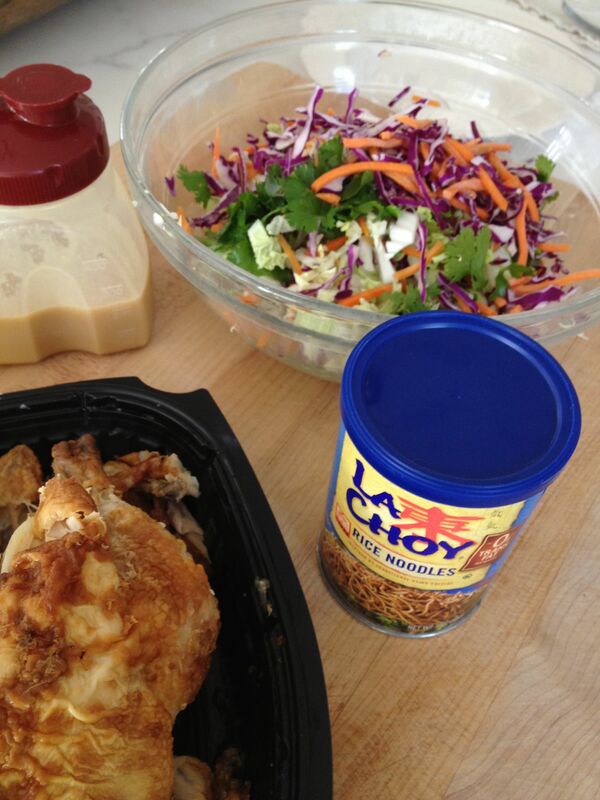 Thanks to my friend Kris F. for telling me about rice noodles! 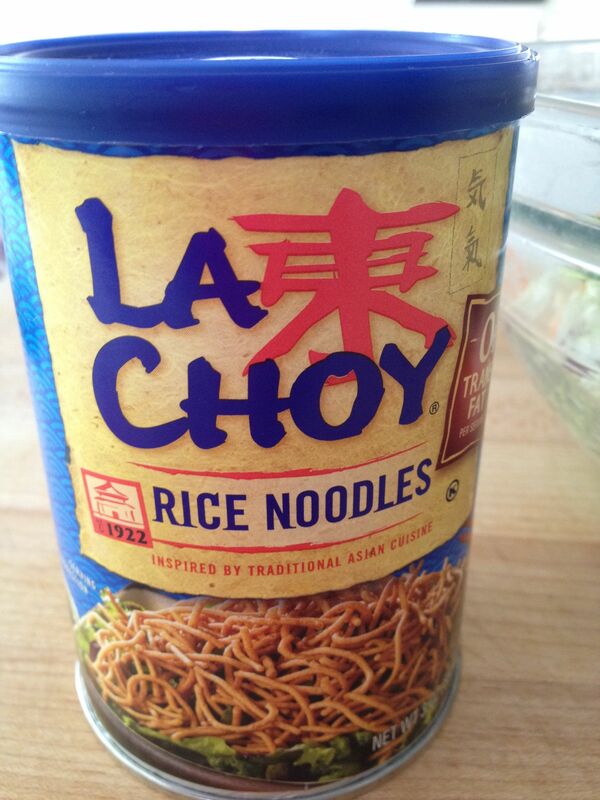 Basically the same as chow mein noodles but thinner and more delicate (and harder to find in stores). 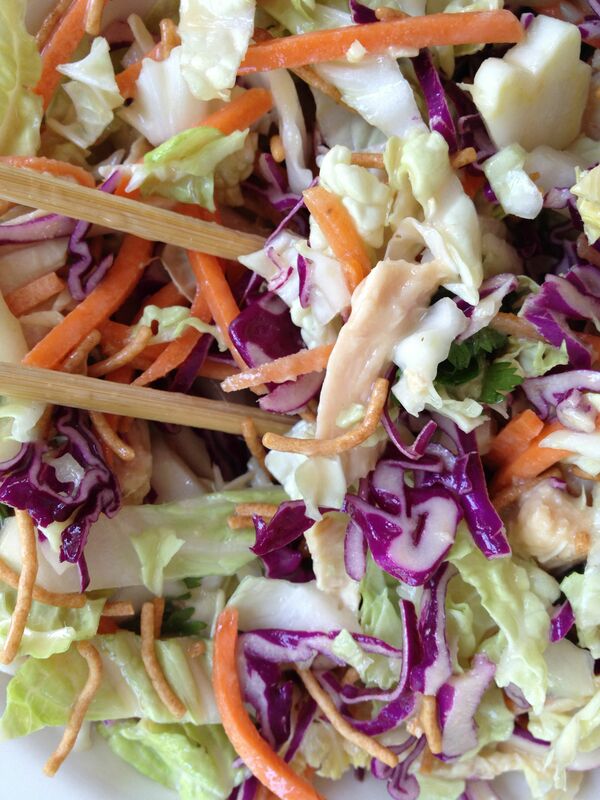 This entry was posted in Asian, Salads and tagged Asian chicken salad, Asian vinaigrette, cabbage salad, Chinois chicken salad, no-cook dinners, rice noodles by subeeskitchen. Bookmark the permalink. Miam !! Shoot ! I’m in Antibes ! 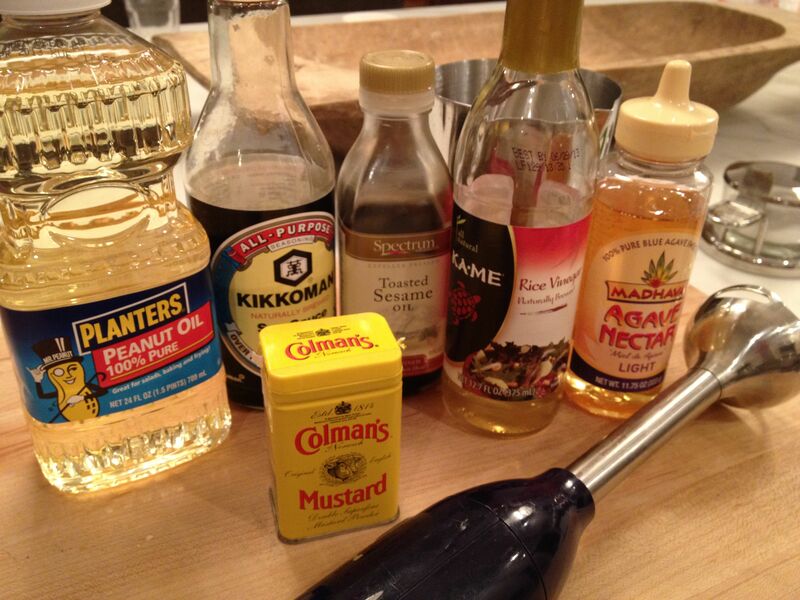 I will definitely be having ingredient issues…. Not sure I’m going to find all that, but I want that salade tonight !!!! ARGH. Well, I’ll shoot for some Eurasian halfbreed. It’ll either be really good or tasteless. No telling. I’ll just have to have a back up reserve of garlic and lime for reinforcements ? Oh, and I need an Agave consult. I just don’t get it… I’ve either bought a dud brand, don’t know how and when to use it or I don’t find it sweetens anything. All right, I’m hitting the super marché. Will send photos along normal channel of communication – from which you have been completely MIA, btw. 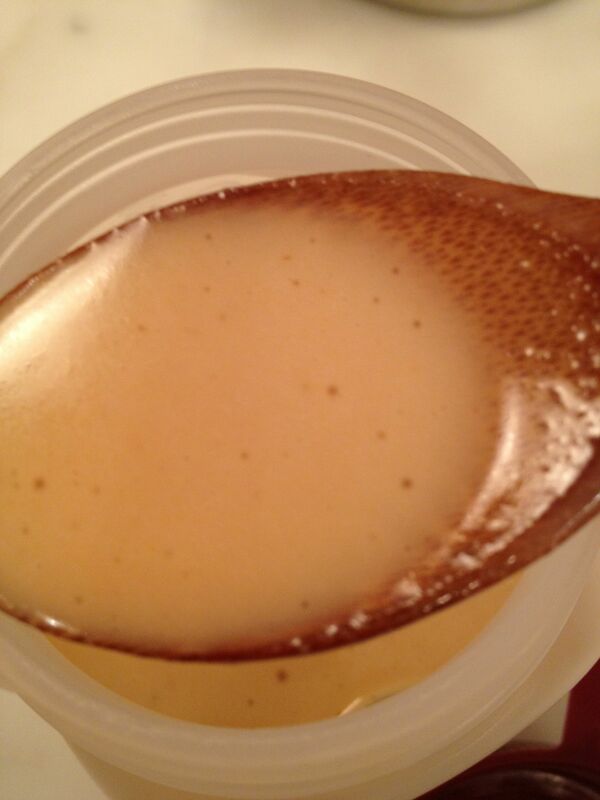 Thanks, Suzie Q, amazing recipe…as always!